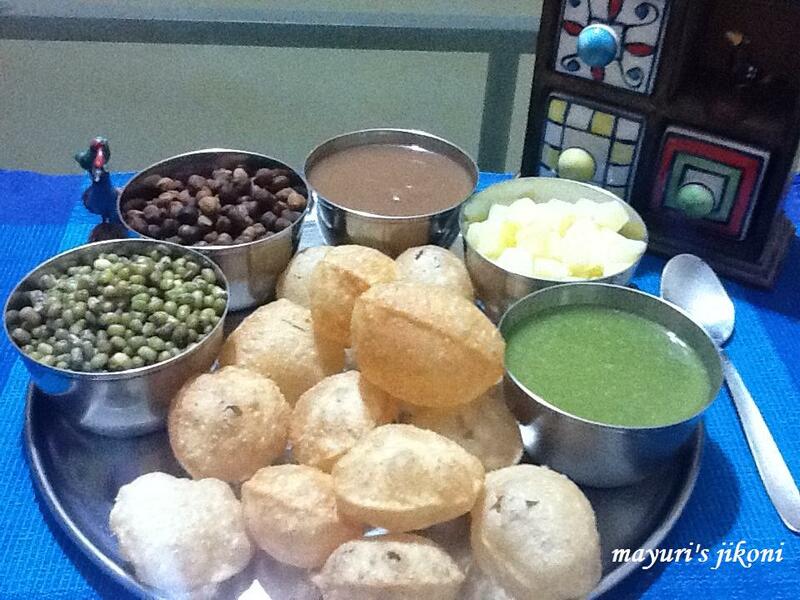 Pani puri is a very famous street food in India. Also known as golgappas, every nook and corner will have a pani puri stall. It is one indian snack that is very popular all over India. Years back, the puris were not available in the shops in Kenya so if we ever wanted to have pani puri, we had to make the puris at home. Its a very laborious task if you have many mouths to feed. I remember helping Nunu to make the puris and it would take us more than 3 hours as the quantity was never small. Nowadays the puris are readily available in market so I don’t make them at home. The best puris in Mombasa are available at the ISKCON temple or popularly known as Hare Krsna Mandir. Soak the chickpeas and green grams overnight. Put the chickpeas in enough water in a pressure cooker. Add about a tsp of salt and pressure cook for 3 whistles. Drain out the excess water. Put the chickpeas in a serving bowl. Boil some water in a pan.Add the green grams and ½ tsp salt. Cook over medium till they are done. Drain out the excess water. Put the green grams in a serving bowl. Boil water in a pan. Add the potatoes and 1 tsp salt. When done, immediately drain out the water and put the potatoes in a serving bowl. Take care not to overcook otherwise they will become mushy. Wash the dates and tamarind. Put the dates, tamarind and water in a pan.Boil the mixture over medium heat till the dates and tamarind are soft. Cool the mixture. Remove any seeds and fibre that may have been left. Puree the mixture in a liquidiser. If need be, add a bit more water. Heat 1 tsp of oil in a small pan. Add the cumin seeds to it. When they pop,add the curry leaves and pour the whole mixture into the date puree. Add salt and red chilli powder. Mix well. First you need to roast the roasting masala. Put the oil in a small pan and heat over low flame. When it is hot, add all the spices for roasting and stir till they become light brownish in colour. Take it off the heat and let it cool. Now to prepare the pani, put all the ingredients including the roasted spices into a liquidiser. Add just enough water from the 6 cups. Liquidise the mixture. Strain it with a sieve. Throw away the fibrous mass. Add the remaining water. At this stage, taste the water and make it according to your taste, more chilli, if you need it or more tangy then add a bit of lemon juice. Don’t make it too sweet as date chutney will be added when serving. Fill the puris with chana, moong and potatoes. Put the pani in individual bowls. Add date chutney according to everyones taste. Some like it sweet, some like it a bit tangy. Pour the pani in the puri and eat. Ask each individual to take some chana, moong, potatoes, pani and date chutney into a bowl. Mix well. Spoon this mixture into the puri and eat. Can prepare the pani and date chutney a few days ahead. Both freeze well. I usually make a huge batch of both and leave it in the freezer. Whenever we feel like having pani puri then the main ingredients are ready. Can use sprouted moong. Boil water, add salt and the moong. As soon as they cook a bit drain out the excess water. Can add chilli powder to the chana, moong and potatoes after they are boiled. I usually don’t as the pani is anyway a bit chilli. If you don’t get raw mango then add about 2 to 3 tbsps of tamarind paste. It is readily available in indian shops or make your own at home. To make at home, just wash the tamarind and put it for boiling with just enough water. When it is tender, remove the seeds and fibre. Liquidise in a blender. Store the extra sauce in the freezer. Mix all the ingredients together and using water make a stiff dough. Let it stand for 30 minutes. Beat the dough using a pestle to soften it for nearly 5 to 10 minutes. Divide the dough into tiny marble size balls. Sorry have no idea how many puris you will get out of this recipe.Its been a long time since I made them at home. Heat oil for frying in a kadai or wok. Roll each ball into a puri and fry over low heat. To make it more crunchy we would put the all the fried puris in a baking tray and into the oven at 100°C for 30 minutes or so till they became crunchy.